The life you’re living today, the level you’re at, and the experiences you are having are because of the decisions you made in the past. It’s the decisions that you make now that will affect the way the rest of your life will end up. Below is a simple example to help you see my point. You’re 17 years old. You and your new-found friends go to a shopping mall. Your friends tell you that you have to steal a car stereo as a sort of initiation to be able to hang out with the group, it’s your test: just go into a back aisle, open the box, and put the car stereo in your backpack. You hesitate and tell them, “No, I won’t do that.” They say to do it or you will no longer be friends. You steal the stereo and get away with it. You feel fearless, accepted, and looked up to by your friends! You are now accepted by this group, and have friends you want to be around and social acceptance. But with friends like that, more trouble and temptation is on the way. You also have the stolen stereo on your conscience for the rest of your life. You steal the stereo and you get caught on camera. Your friends bail on you and you’re left taking the rap. You now have a record, your parents are ashamed of you, and at every job you apply for, you will be haunted by your record as a thief. Your life goes into a downward spiral since you were labelled a thief. You start to believe you are one and start to practice that as a way of life. You have just put a red X on your life that can spiral into something worse, something you’ll regret, and feel ashamed and embarrassed about for the rest of your life. You tell your friends you won’t do it. They say, “Well then, we are no longer friends.” You walk home, with fewer friends. You’ll find new friends that don’t act like a gang. You’ll look back on this and feel good about our decision to do the right thing. You have just built your self-esteem, whether you know it or not. You feel good about your choice. As you can see from the above example, the decisions you are making today may affect the rest of your life. So when you’re making a decision, take a little more time and avoid making hasty decisions. First, I’d like to mention that I’m the type of person to make decisions quickly and on the fly. Well, that really didn’t work well for me, in fact, it backfired almost every time. So I have taken a new approach. 1. Take Your Time. It’s your decision, and you’re entitled to think about it. As you read above, a hasty decision can become a disaster for you. 2. Role Play. Use the two or three different scenarios. Think, if I choose this then what might happen; if I choose another option what might happen? When important decisions are being made, make sure you write everything down, so you’ll have clear and focused ideas. 3. Research. With the abundance of information online, you can easily improve your knowledge and make more informed decisions. 4. Who Is Involved? Talk it over with other people that the decision affects. You can’t just plan to move to a new city without talking it over with your family. Get their input on the issue, and you’ll find a lot of things you didn’t anticipate. 5. Ask. Talk it over with other people who have gone through what you are deciding. Talking to someone who has experienced the same thing can be beneficial, and may reveal some new insight that you haven’t considered. 6. Sleep on It. This gives you time for your mind to process all the information. 7. Avoid Thinking About It. Try and do something different: watch a movie, go to a sports event, go out with your friends, go out to dinner. Once you distance yourself, you may get a flash of insight. Remember, your mind needs time to process. 8. Use Intuition. With the information you now have and the time you took to allow your mind to process, it’s now time to get your intuition involved. How does it feel? Feeling good means your on track; a bad gut feeling or tightness in your body is something telling you this is not the right decision for you. 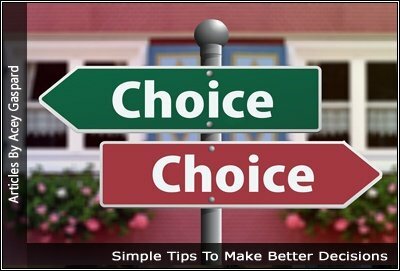 Taking the above approach gives you a much better chance of making the right decisions, as opposed to deciding something on the spur of the moment.